The best AR15 is the one that works the best for the person using it. This means ditching the generic gun and personalizing your weapon with the right AR15 parts for you. From hacking your handle to picking different pins, we have tips we bet you’ve never thought of. 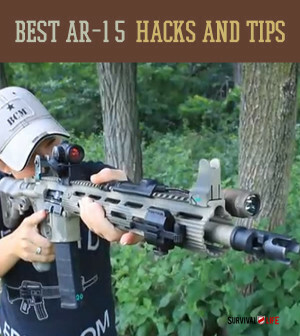 You can easily become a better shot and enjoy shooting your AR15 even more. Using this list of tips, you’ll have your gun souped-up and tricked-out in no time. One of the most common complaints about the AR15 is that the hard plastic grip that it comes standard with is uncomfortable, especially when operating the gun for extended amounts of time. An easy way of personalizing your weapon is to switch it out with a more comfortable grip that fits your needs! Another quick hack is to add stippling to your weapon. Whether you add it to the magazine, the handle, or anywhere else that might need a little extra grip, this cheap and easy tip will help make your gun even more perfect for you. The trigger of your gun is just about the most important and personal piece of your firearm. If you don’t have the right trigger, you’ll never be completely happy with the weapon. And with modern firearms technology, replacing the trigger of your gun is cheaper and easier than ever before! This can be especially helpful for left-handed AR-15 users. They make a variety of these handles that work great with an AR-15. Even a simple switch like this can make your gun more useful and more personalized to your needs. These pins for your AR-15 lower don’t rotate while firing your weapon. Standard pins move a small amount and over time will cause wear on your gun. Using these will keep your pins and place and your gun in top condition. This is less about the function of your firearm and more about how cool it looks. But who can resist making their AR 15 look even more badass. Depending on what you’re looking to do with your AR15, you could want variety of different barrels. Such a simple change could completely transform your gun for the better! Your choice of muzzle will depend on what exactly you’re wanting it to do. Whether to help with recoil, sound, or flash, there’s a great muzzle out there for you! Slings and hardware for your AR15 can go a long way in making the gun easier to use and carry.